There may be some truth that parents of toddlers need to get out of the house more. 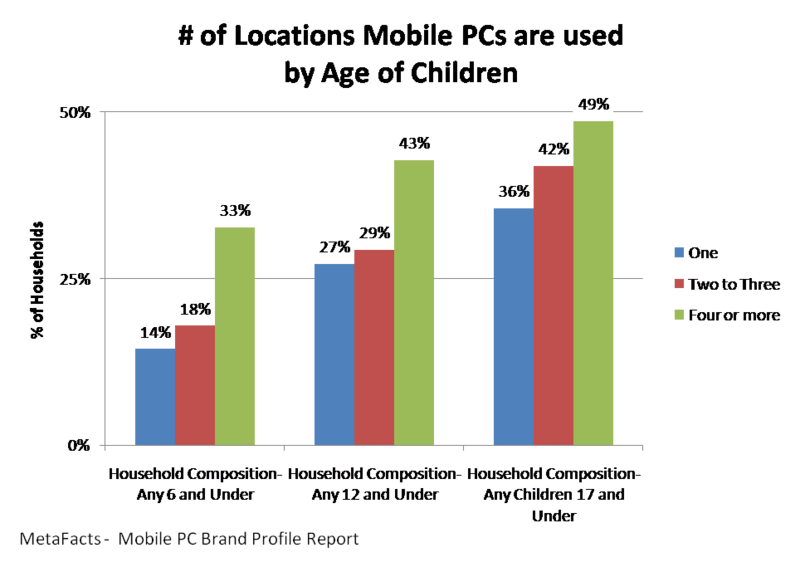 The age of children in the mobile PC user’s household has a high correlation with the number of locations where they regularly use their mobile PC. Households with the youngest children – those age 6 and under – have the highest relative percentage that use their mobile PCs in four or more locations. Twenty percent of all mobile PC households have children age 6 or under, and 33% of households who regularly use their mobile PC in four or more locations have children age 6 or younger. Similarly, although not quite as dramatically, nearly one-third (31%) of mobile PC households have children age 12 and under, and of mobile PC households regularly using their mobile PC in four or more locations, 43% have children age 12 and under. MetaFacts releases ongoing research on the market shifts and profiles for Windows Vista, Mobile PCs, Workplace PCs, Home PCs, Moms and Dads, Web Creators, Broadband, and many other technology industry topics. These Profile Reports are in a series on specific topics utilizing the Technology User Profile Annual Edition study, which reveals the changing patterns of technology adoption and use in American households and businesses. Interested technology professionals can sign up for complimentary TUPdates, periodic snapshots of technology markets.